Since the marked decrease in Facebook reach, everyone’s been talking about Promoted Posts and whether they are worth the bucks. I’ve been running a review myself and it concurs with what the industry is saying … reach is down by more than 50%. Of course there may be some room in the calculations for the ‘time’ and ‘day’ that posts are made or changes in the consumer reaction to the actual messages, as well as market-place ad spend, but regardless this drop speaks volumes about the way Facebook is restricting communications into the newsfeed. With this dramatic drop in reach I did a test using Promoted Posts on a campaign that consisted of a nearly identical competition run over two consecutive weeks. The difference between the promoted post and the non-promoted post was an increase in reach of 7%. 1. Facebook approve promoted post content, so the promotion may not start immediately. 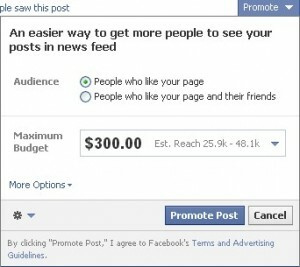 Also for new users Facebook limit spend, increasing your daily allowance as you use it, so plan for that if you have upcoming content that you want big-reach for, by doing a few smaller promotions in advance. 2. You can cease your promotion (and therefore spend) at any time by ‘pausing’ it and choosing not to recommence it. Once your promotion has ended (budget/time frame) however you cannot restart … so choose your budget wisely. 3. Page admins are reporting strange geo-targeting while using Promoted posts, and I’ve experienced this too. Unless you wish to attract that ‘international audience’, you may be able to avoid some of this by working within your time-zones―pause your post overnight, resume it in the morning. 4. With several Facebook ad-style options available it’s important that you determine what you are using Promoted Posts for. You have two audience options – choose to promote to People who like your page, or People who like your page and their friends. As a marketer gut instinct says: choose ‘People who like your page and their friends’, after all, won’t that mean new Page Likes? But I think this may be misleading (and one of the reasons we are receiving oddly targeted users). Your Fans have already connected with you and value your page, but are probably not seeing it anymore, so use Promoted Posts to reach back out to them. They are the users most likely to like, comment and share, thus their actions will be displayed to their friends anyway. Finally, remember that results WILL vary. Facebook is not a free-platform, so while I’m not thrilled about the severe reduction in reach we are now receiving, don’t expect me to have a rage-against-the-machine here. We are also exploring ways to make ad targeting capabilities more built into the ad creation process by default, so that when you promote a post the delivery takes into account the right audience more often. so sorry Philip but – ‘more often‘ just doesn’t cut it. 5 Responses to "Facebook Promoted Posts – sizzle or shizzle?" I’m confused. You said that once the promoted post is paused you can’t restart it, then you later recommended pausing a post overnight then restarting it the next morning…?! Hi Joey, no – once the promoted post ‘ends’ (budget or time-frame used up) you can’t restart it. My understanding is that you can pause and recommence it until the budget/time runs out as often as you like. I also think the reach statistics that Facebook is giving are complete bogus. I got 4 shares on a post and likes continued to flood in for a good week long period.. yet according to facebook there were only 36 viral views. Alarm bells?! My biggest issue with Facebook isn’t that I have to pay for promotion … but their lack of transperancy over what we pay for and what we receive. Lots of people think their stats are bogus. I’m thinking shizzle. Annoyed with facebook!